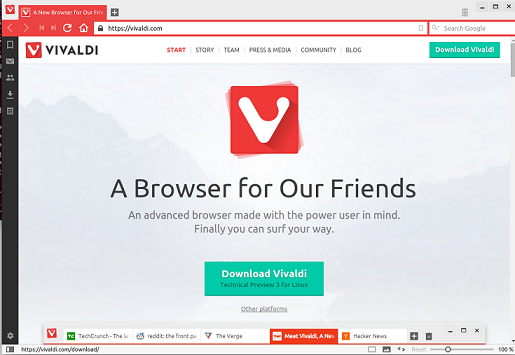 Vivaldi is a new, free, web browser being developed by some ex-opera team members of well known Opera browser. The design goal of this web browser it to provide classic opera look and feel to users and help users migrate from opera to this new Web browser. Recently, Technical Preview 3 has been released for this browser. In order to understand what Technical Preview means, please note that it is actually Pre-beta release of the application, so it is still in the initial testing stages, technical preview version will emerge into beta release and after successful testing and user’s satisfaction, beta release will emerge into stable version of this software. This project started as virtual community in 2014, In January 2015, Vivaldi community was launched and the very first technical preview of the web browser was made available for download and testing. Since then, it has been under consistent and rapid development and team is preparing to enter into Technical Preview 4 now. It offers a lightweight interface due to the minimalist features, its color schemes change every time you visit any webpage, it adjusts itself according to the color scheme and background of the web page being visited, so you get a pleasing feel. It is built on the basis of latest web technologies, including HTML5, Node.js, React.js etc. You can perform various operations with bookmarks, “quick commands” let you perfom the common browser related operations quickly. It is specifically developed on the original opera model “Blink layout engine”. The latest technical preview version of this browser is all about bug fixes, it received major bug fixes for the areas of Zoom, UI, Rendering etc. 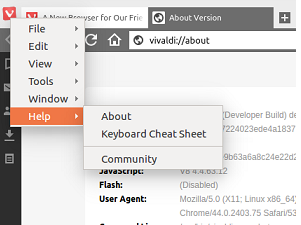 Let’s review the installation process for this browser on ubuntu. Here is the download page for this web browser, choose the installer according to your operating system and architecture. 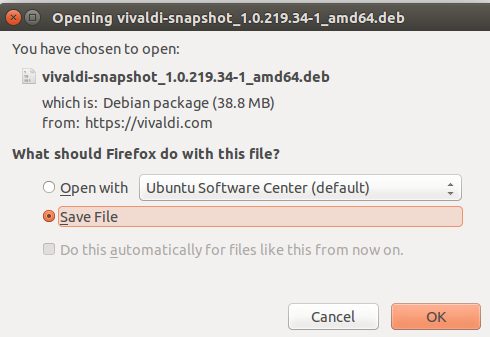 We have downloaded the installer package for ubuntu 15.04, 64-bit architecture. Once the download process is complete, go to the download location and run following command to install it. Lauch it by running the following command on the terminal. File menu will let you see more into this browser, just browse around different option to get familiar with the features of this browser.